Alberta Snyder was honored by friends and relatives today at the Township Committee meeting on September 11, 2018, in celebration of her 100th Birthday on August 7, 2018. Alberta Snyder was born in the home on East Mountain Road where she currently resides and has lived in Hillsborough Township for all of her 100 years. Alberta Snyder married Ernest Snyder in 1938 and celebrated 62 years of marriage prior to Ernest’s passing. They were blessed with two children, Jean Terhune and Matt, and one grandson, Matt Terhune. Alberta Snyder served as Hillsborough’s Assistant Tax Collector for Hillsborough for 24 years and has been an active participant in the community for over 70 years. She has been a community volunteer with the PTA, Hillsborough Republican Party, Neshanic Methodist Church, South Branch Reformed Church, Rotary fundraising and the Hillsborough Historical Commission. Alberta Snyder helped establish evening hours in the Tax Collector’s office. She is the co-sponsor of the Santonastaso/Snyder Scholarship Fund that has awarded over $10,000 over the years to seniors in high school pursuing a major in a field that will benefit society. Alberta was honored by the County Republican organization for 70 years of combined service with her husband, Ernest. Her favorite hobbies are reading the local papers, working to solve her daily Word Wonder challenge and baking for many fundraisers. 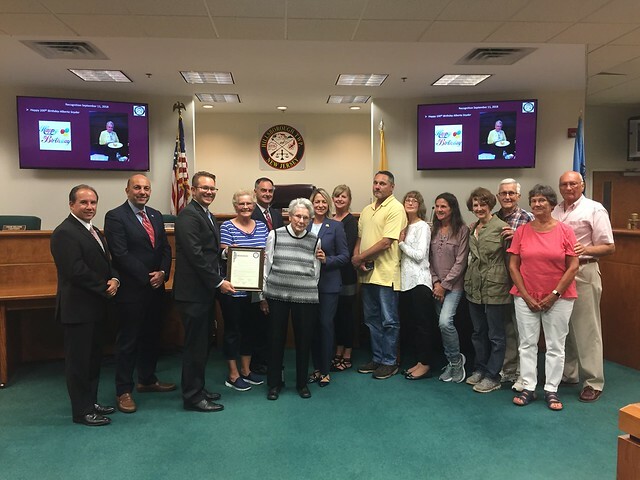 The Hillsborough Township Committee congratulates Alberta Snyder on her 100th birthday and offers best wishes for many more happy days in the future to share with family and friends.